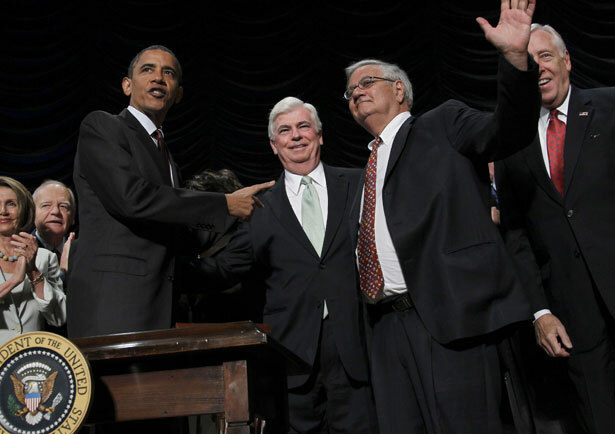 Dodd-Frank didn’t succeed in putting an end to “too big to fail” banks, but a new bill to restore the Glass-Steagall Act might. When Barack Obama boasted that his administration had put an end to “too big to fail” banks, it was probably the biggest fib of his presidency. The legislation known as Dodd-Frank did no such thing but its passage effectively closed the subject. Many Democrats in Congress knew better but did not wish to complicate politics for their president while he campaigned for re-election. The law was riddled with rubbery claims and loose language but wishful thinking assumed the federal regulators would give it backbone. That frail hope vanished rapidly. Squads of bank lobbyists swamped enforcement agencies. Republicans worked relentlessly to protect the bankers from the public’s demand for reform. Obama kept repeating his facile claim of victory when he surely knew it wasn’t true. This was a depressing spectacle of failed politics. But it is not the end of the story. A new reform movement is struggling to find shape and voice in Congress. It will not wait for Barack Obama to take the lead, since his solicitude for big-name Wall Street banking continues undiminished. And some old bulls in Democratic caucuses remember they had voted for the Clinton-era deregulation that led to the financial instability and collapse. Wall Street money remains mother’s milk for both political parties. Nevertheless, at the risk of sounding too wishful myself, I see the outlines of a vigorous new reform caucus developing. Do not expect instant success but new faces have nothing to hide or explain away. The country is still paying dearly for what the bankers did to the economy. Even worse, the nation is still at risk of another breakdown because the basic problem of recklessness has not been fixed. Senator Elizabeth Warren, the fresh face from Massachusetts, has joined Republican Senator John McCain of Arizona, Democratic Senator Maria Cantwell of Washington and independent Senator Angus King of Maine as co-sponsors of a bill to restore the Glass-Steagall Act—the New Deal reform that separated investment banking from commercial banks. The Federal Reserve under Alan Greenspan led the charge on gutting Glass-Steagall. Bill Clinton collaborated with right-wing Republicans in repealing the law. Senator Sherrod Brown, Ohio Democrat, has teamed with Senator David Vitter, Louisiana Republican, to push a remedy that could act faster—imposing higher capital requirements for risk-exposed mega-banks. These parallel measures would naturally provoke intense attacks by the banks, but the political assumptions may be shifting for reform-minded advocates. Why are the big banks still getting away with highway robbery while the country remains mired in a stagnant economy? Democrats could run on that issue in 2014 and aim the same question at the two-faced Republican party. The GOP stands with the bankers and against consumers and gets away with it. For that matter, so do a lot of Democrats. This is good fight to have. It it will clarify the true intentions of both parties. Elizabeth Warren is tackling Wall Street, and she’s starting with student debt.